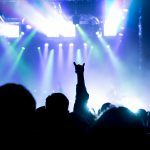 Gas Monkey Live opened doors at 7 and it seemed the venue couldn’t fill up fast enough. 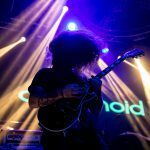 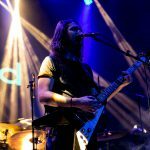 Openers Astronoid were first up in the prog metal madness of The Convergence Tour, and I had no idea that they’d set the bar so high. 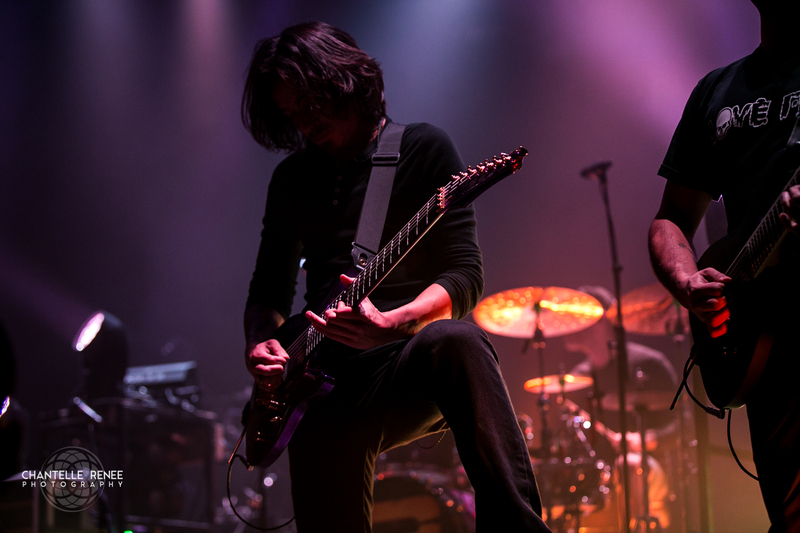 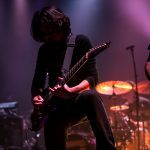 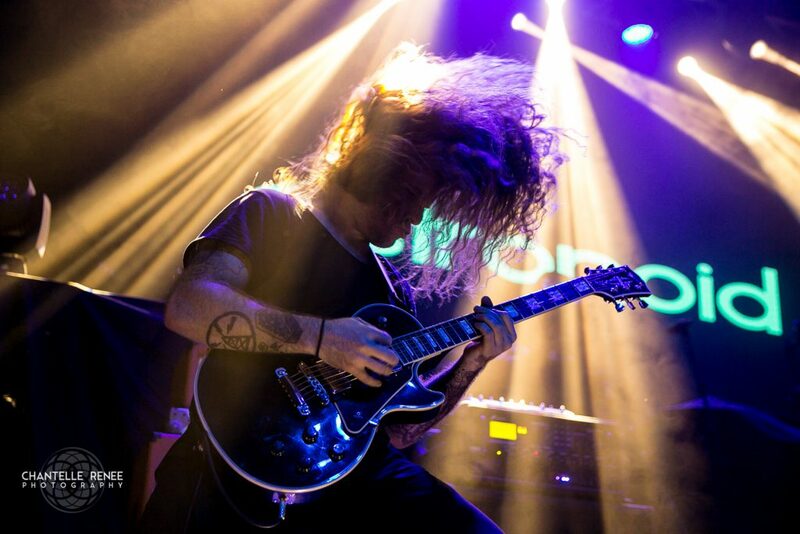 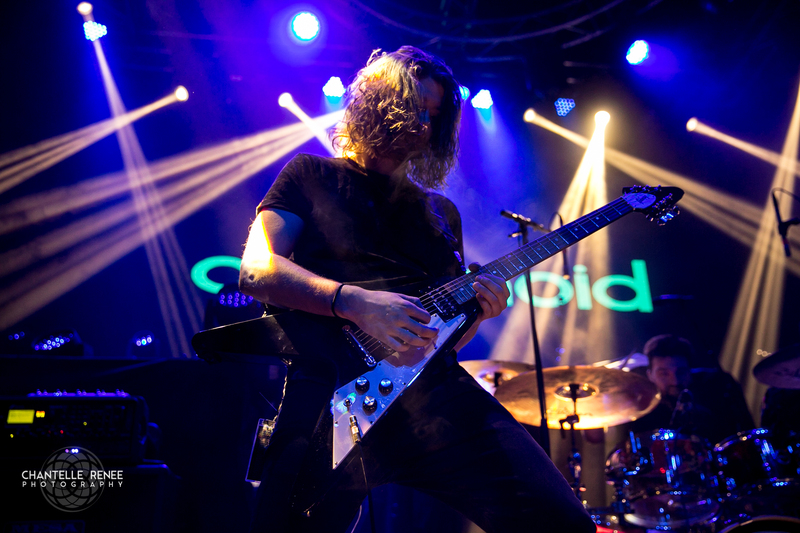 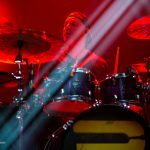 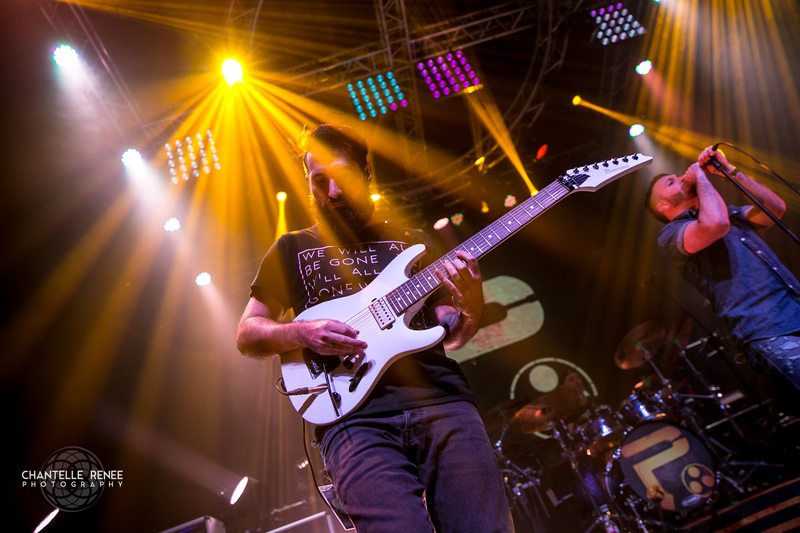 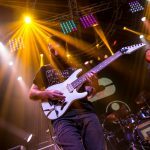 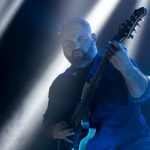 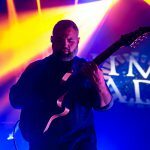 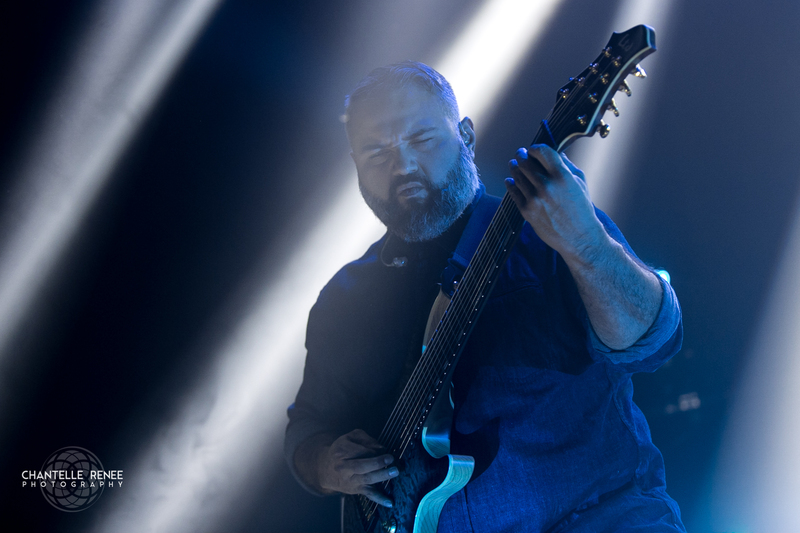 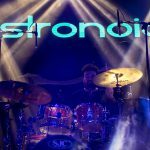 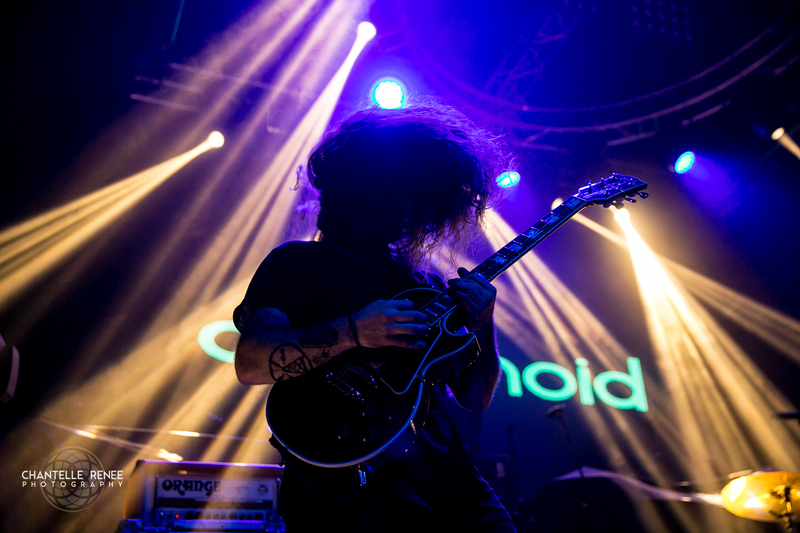 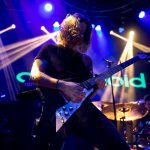 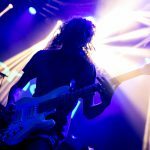 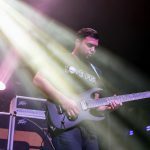 Mixing ambient and beautiful clean harmonized vocals, guitarist and sole vocalist, Brett Boland pairs his ethereal voice with swirling wall of noise riffs and high tempo drumming, leading to a high energy “dream thrash” experience. 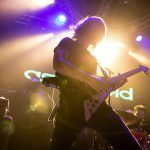 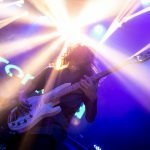 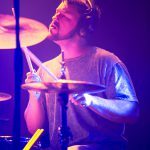 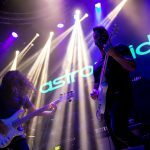 Not through and through set on any particular influence, Astronoid draws from a vast array of different bands with quite unique and identifiable sound, somewhere between Devin Townsend, Cynic, Alcest, and Emperor but mixed with their own flavors. 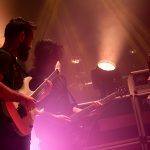 The emotion and intelligence put into the music leads to an engaging and massive performance, and as their first full length titled “Air” implies, it carries an airy and organic wall of sound. 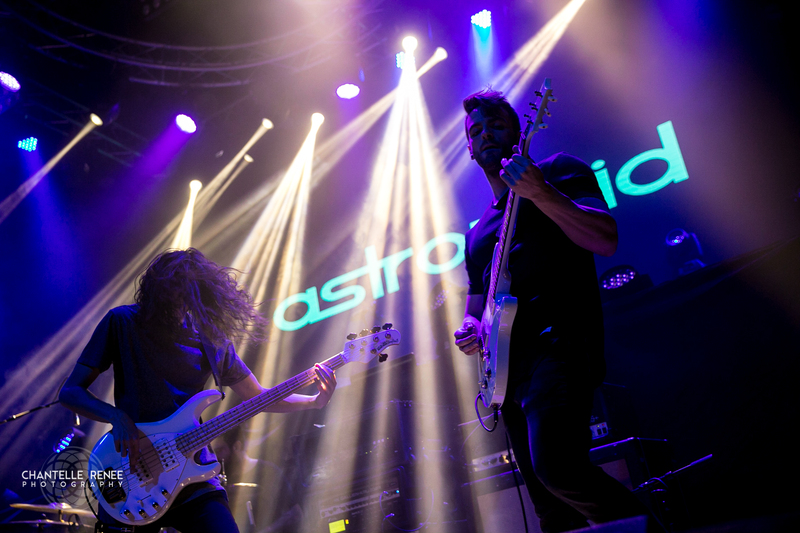 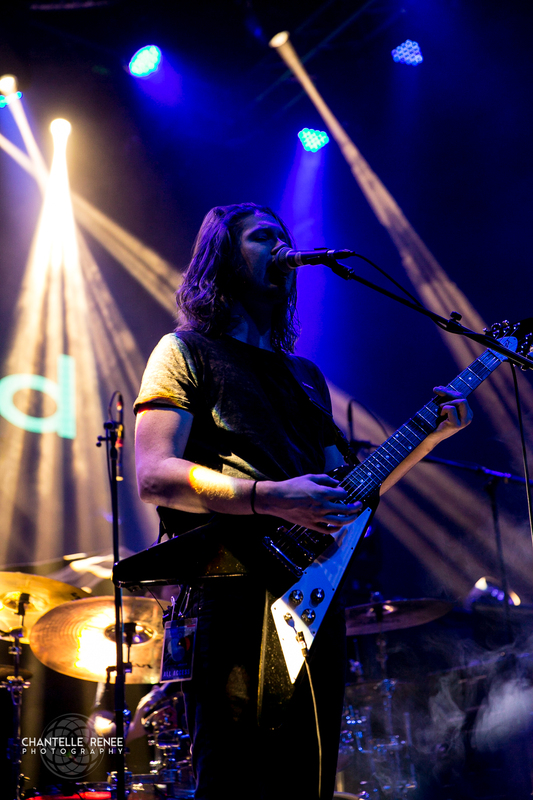 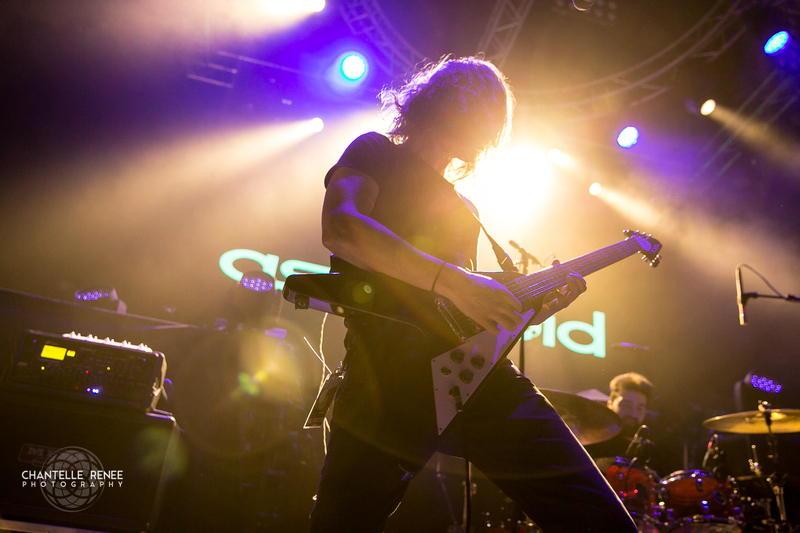 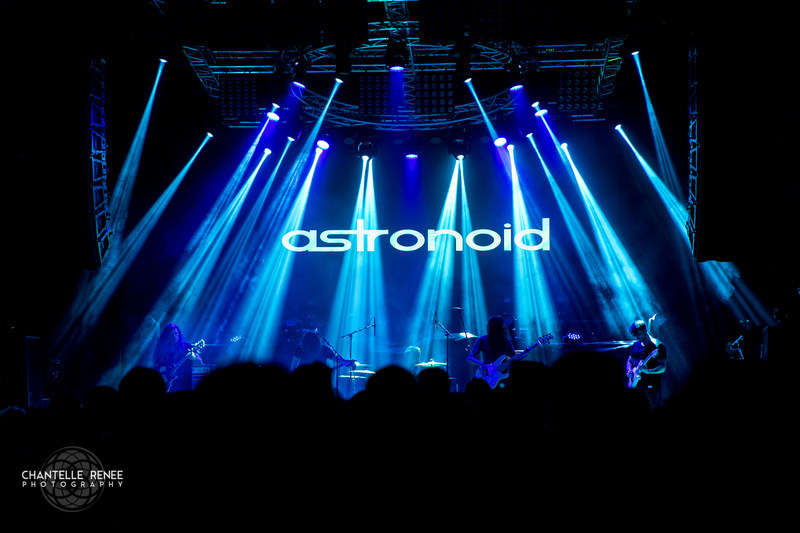 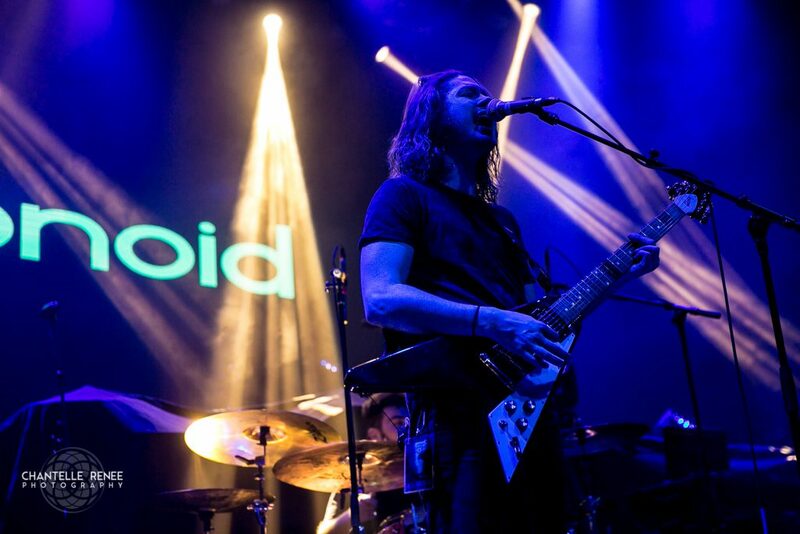 As it sometimes goes, bands of experimental genres don’t tend to carry a good stage presence alongside their audible offerings, whereas Astronoid not only brought the impossibly resisted catchy hooks, they head-banged alongside the audience in synchronization. 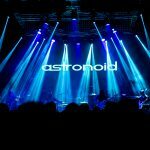 Astronoid tote quite a few impressive tours under their belt, and this is just the beginning for one hell of an impressive band with a live sound to die for. 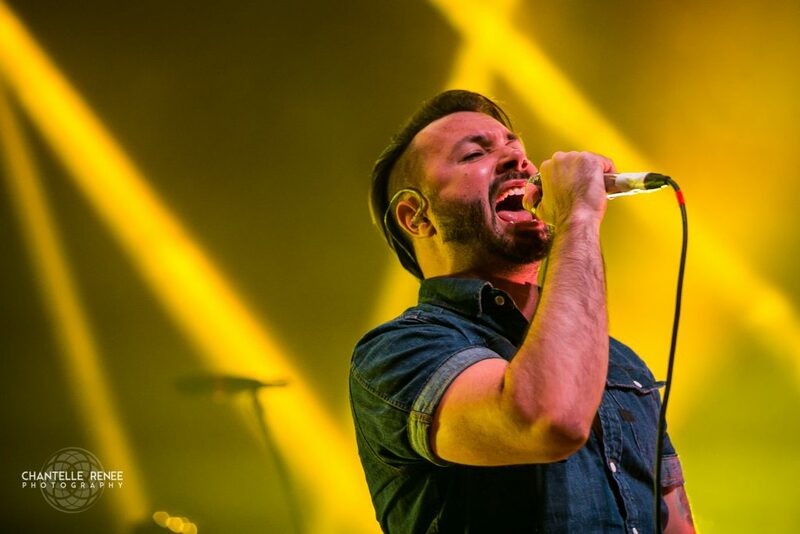 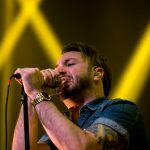 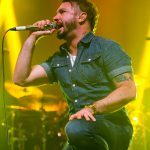 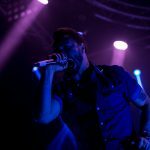 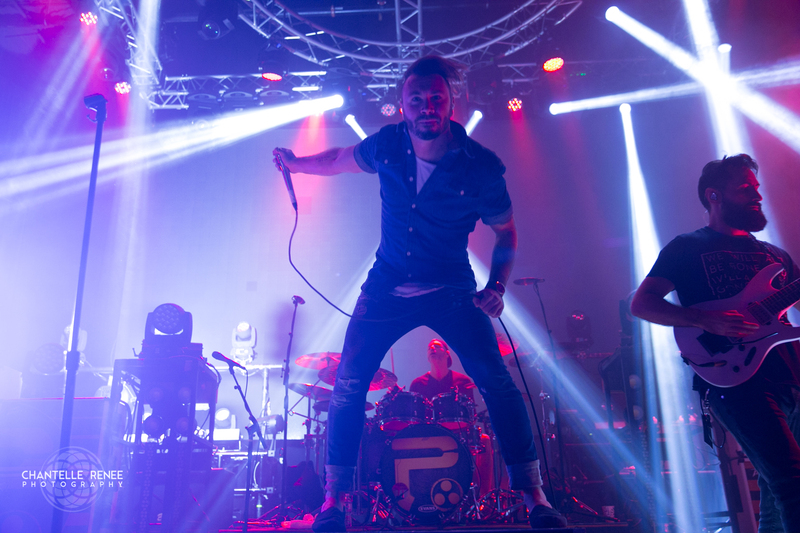 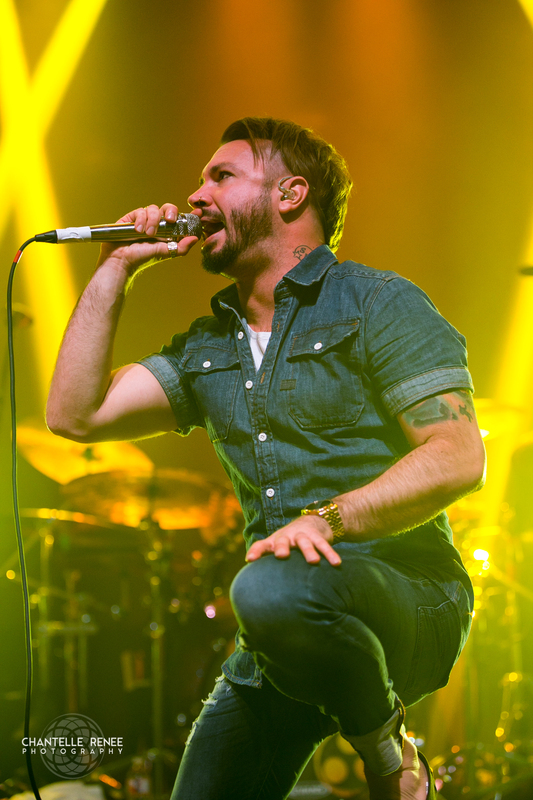 Periphery opened with their typical off the wall goofball behavior, playing a sound clip through the PA that had something to do with a guy giving a detailed explanation as to why he can or cannot wear a new belt buckle without getting back on a bull. 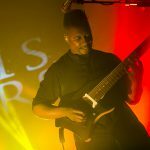 With no explanation or hesitation, they jumped straight into the song that influenced my purchase of a 7-string so many years ago, “Icarus Lives!”. 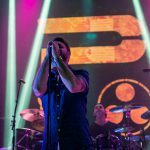 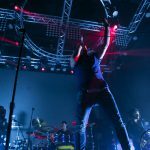 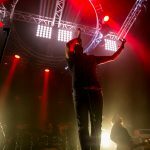 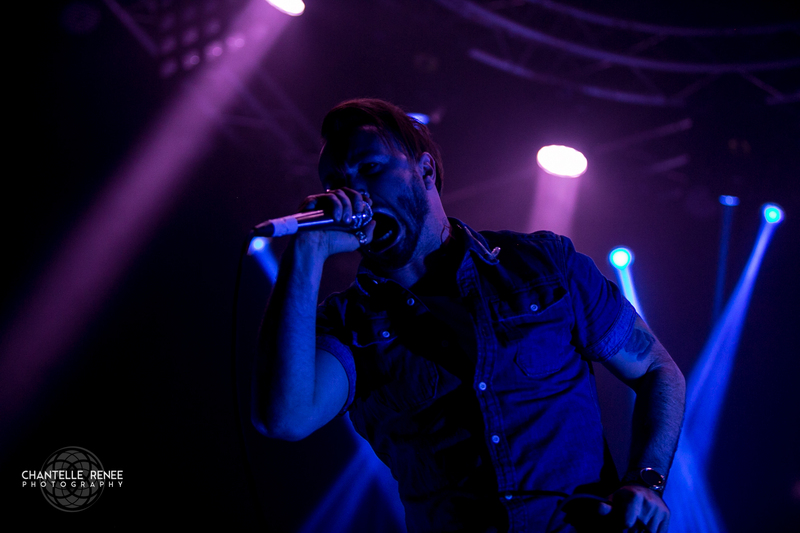 Blending a high energy performance with their legendary sense of humor, Periphery spent just as much time jumping off risers and giving high fives to one another (Misha and Mark, you guys made the set for me there) or headbanging to undeniably catchy and groovy riffs they’re known for. 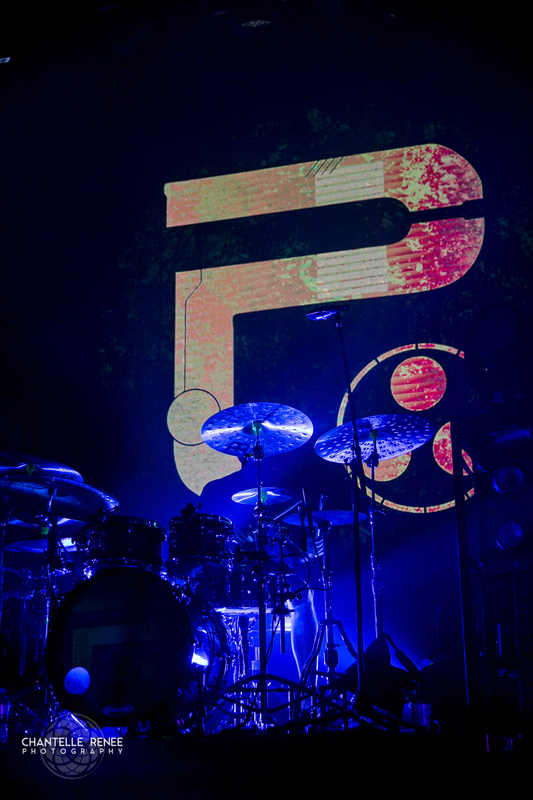 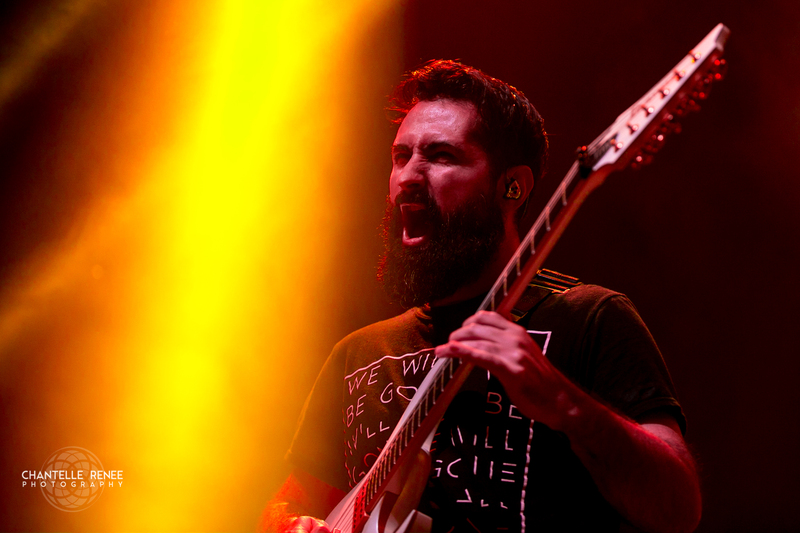 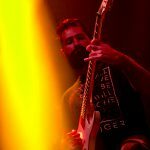 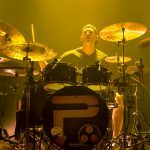 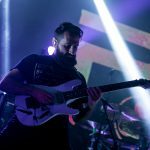 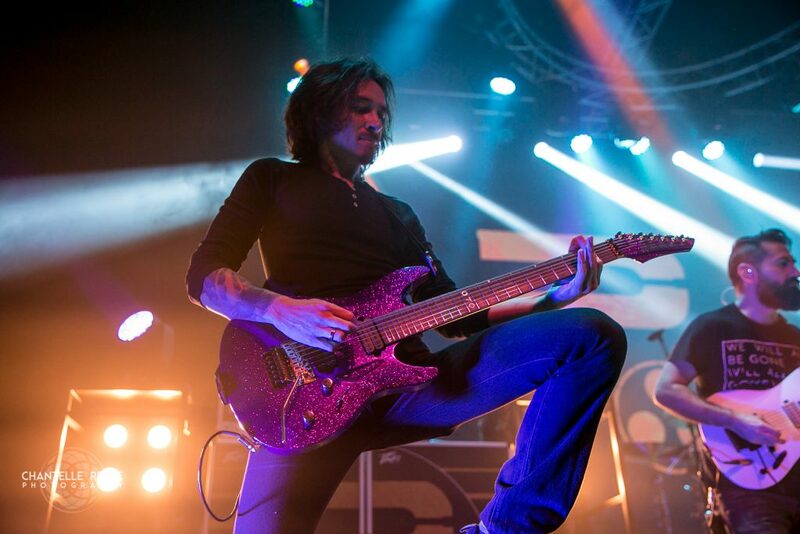 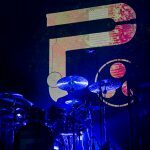 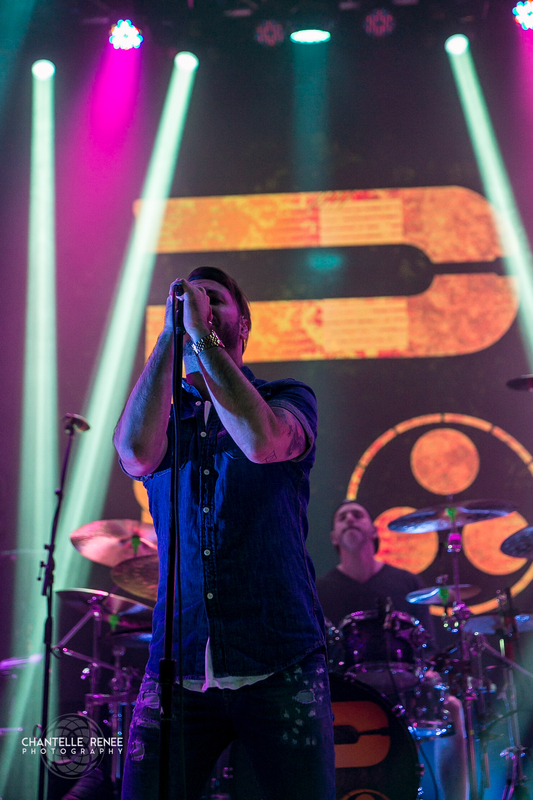 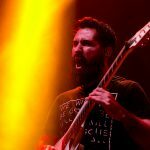 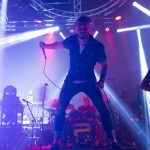 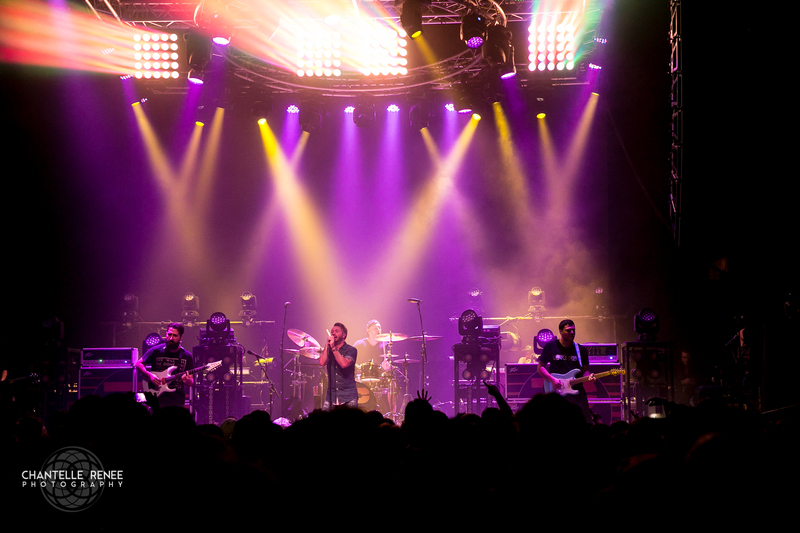 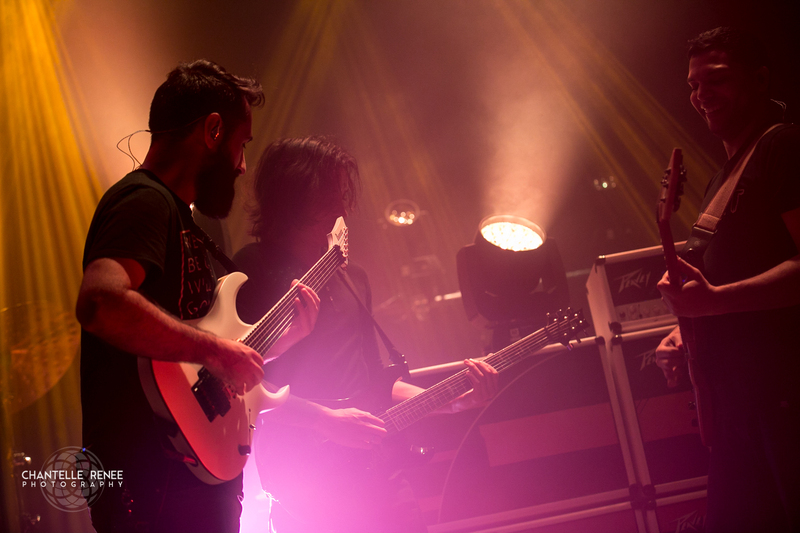 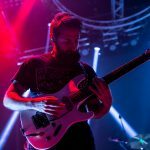 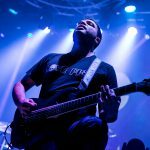 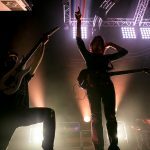 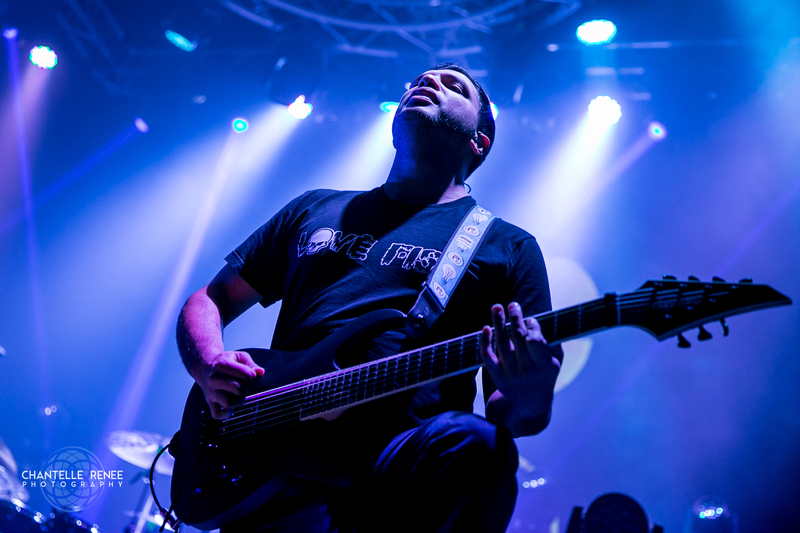 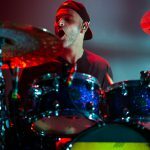 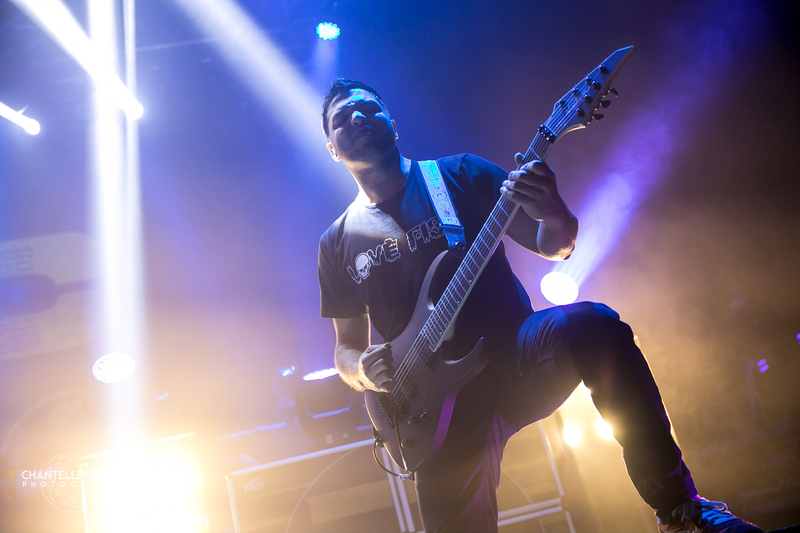 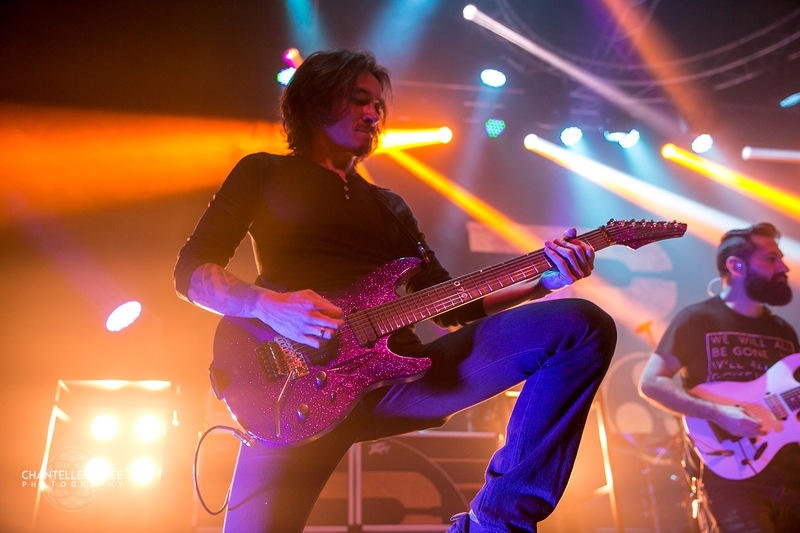 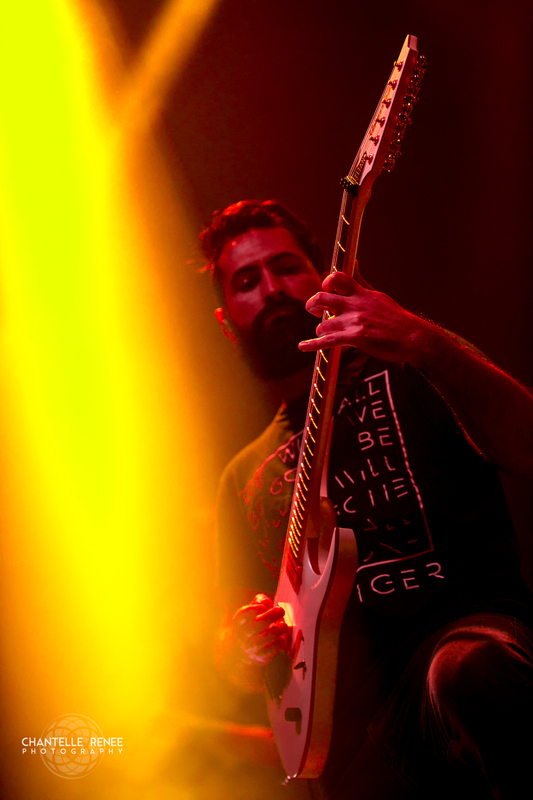 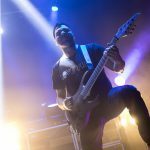 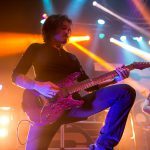 Periphery always manages to sound massive live, with or without a live bassist – they’ve featured a backing track the last two times I’ve seen them, yet lose no momentum with just guitarists onstage. 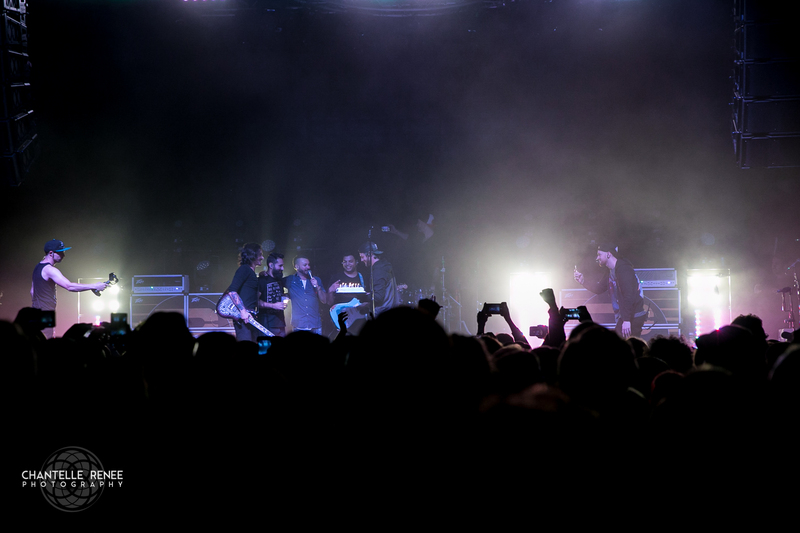 Vocalist Spencer Sotelo impressed yet again with his awesome stage presence; dancing, jumping, and flailing along with the music as it moved on alongside his cohorts, intermittently bantering to the audience as their extended song changeover was carried through by different ambient notes in the PA. Guitarist Jake Bowen’s birthday happened to be the same day as the show, leading to a mid performance pause during a guitar swap where the band brought out a birthday cake with candles and led the audience in singing happy birthday. 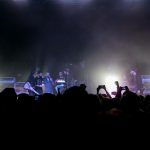 Silly antics continued as they made their way through a 10 song set of all different and fairly serious sounding songs, dedicating the last to the power of love. 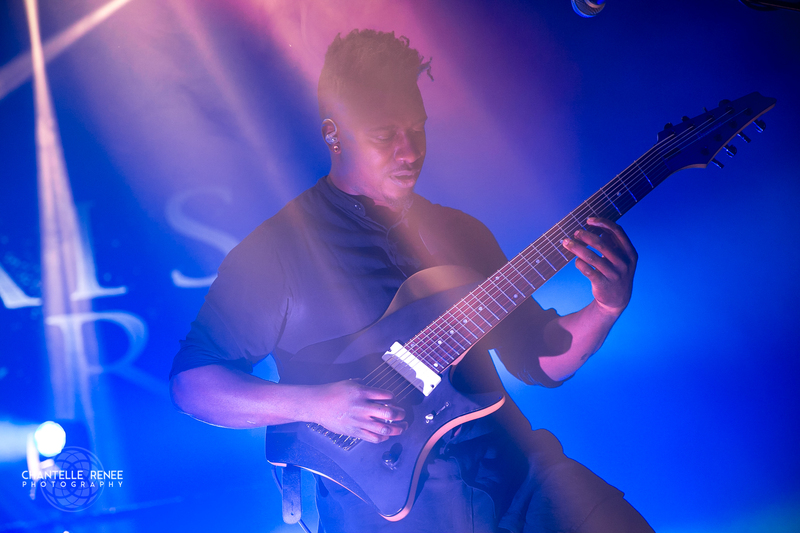 8-string guitar heroes Animals as Leaders headlined the show for the night, brandishing a plethora of unique works of art that also happened to function as guitars. 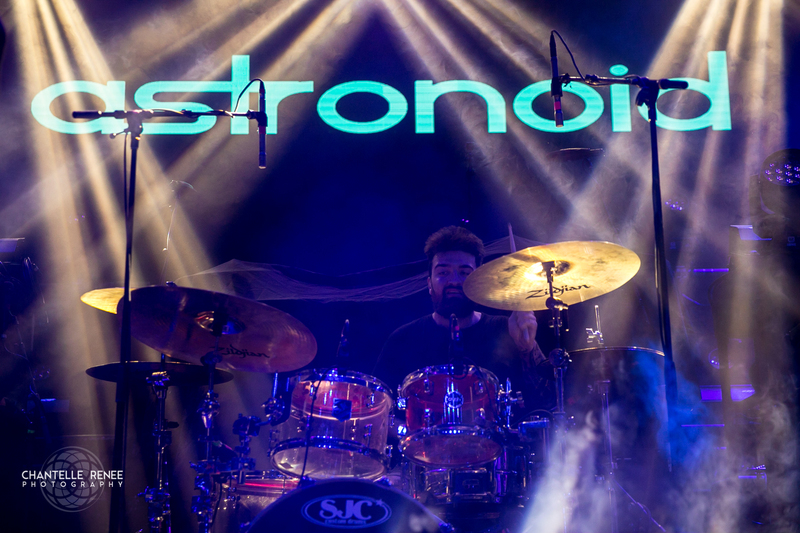 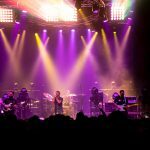 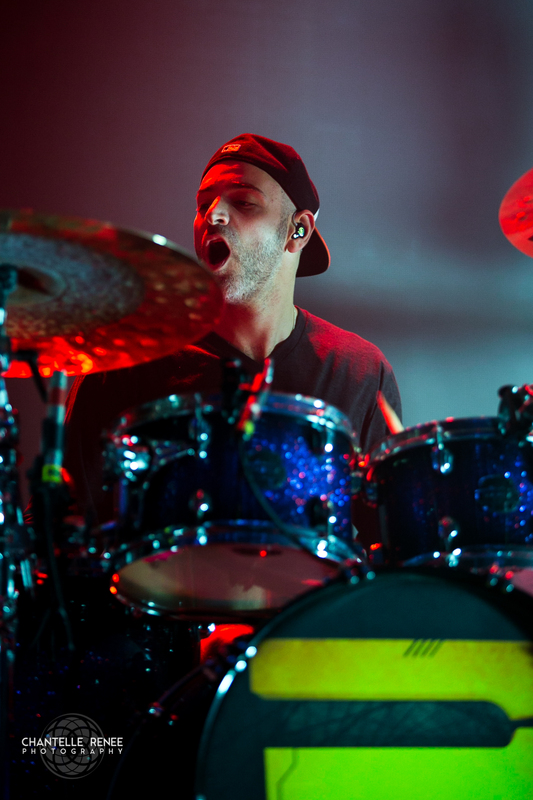 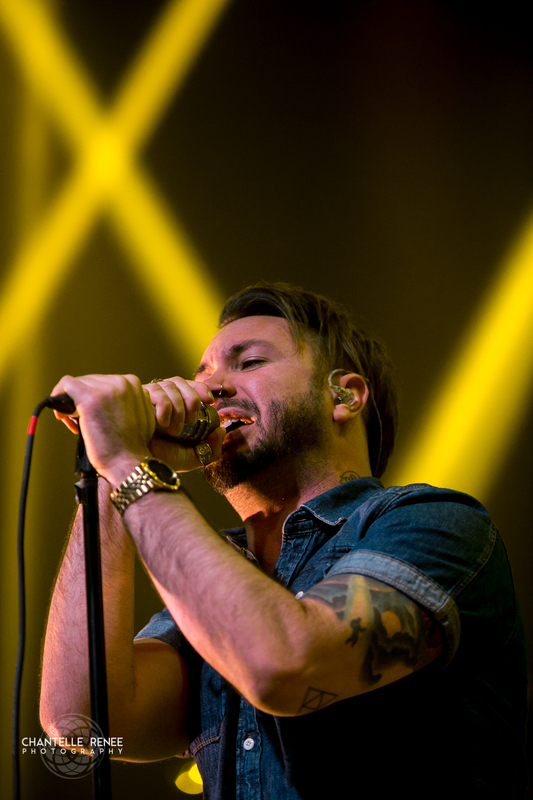 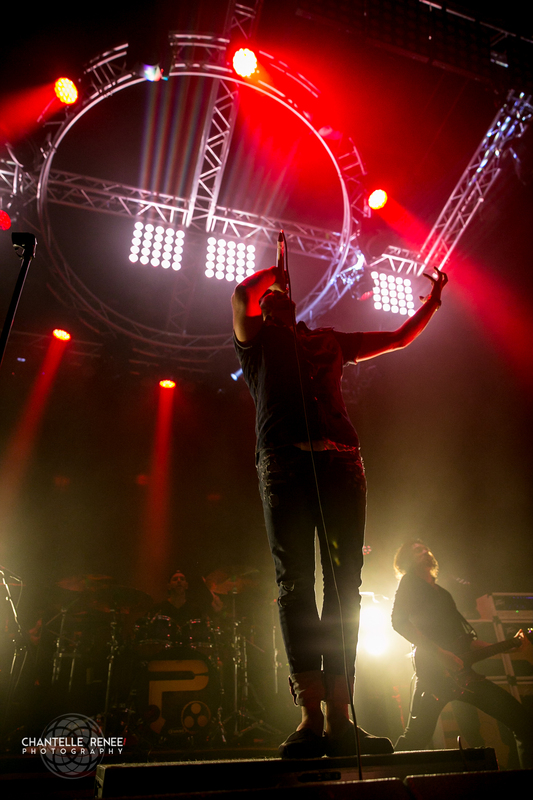 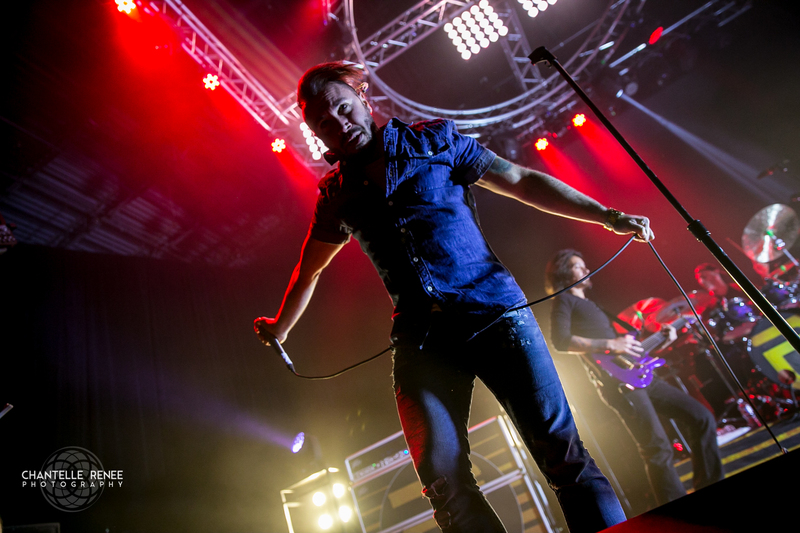 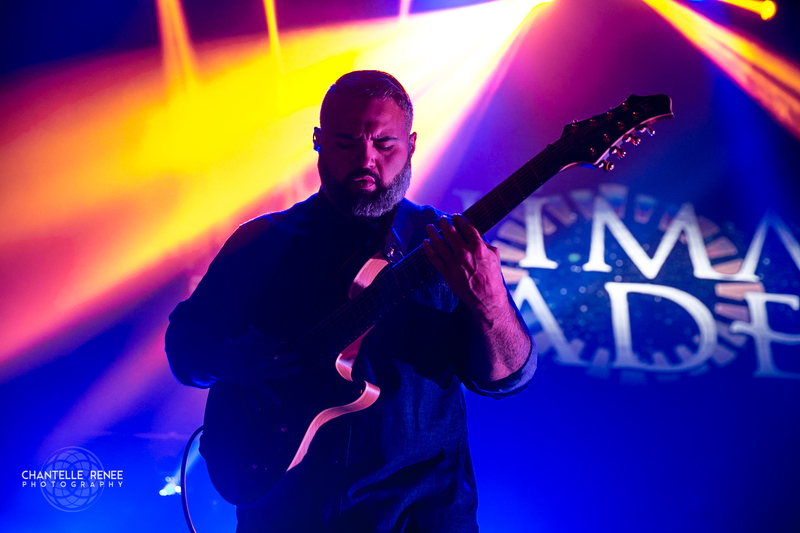 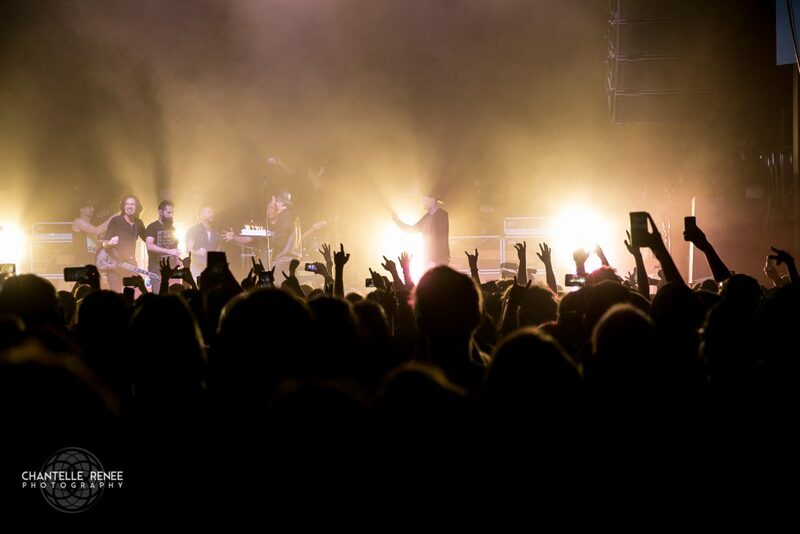 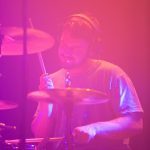 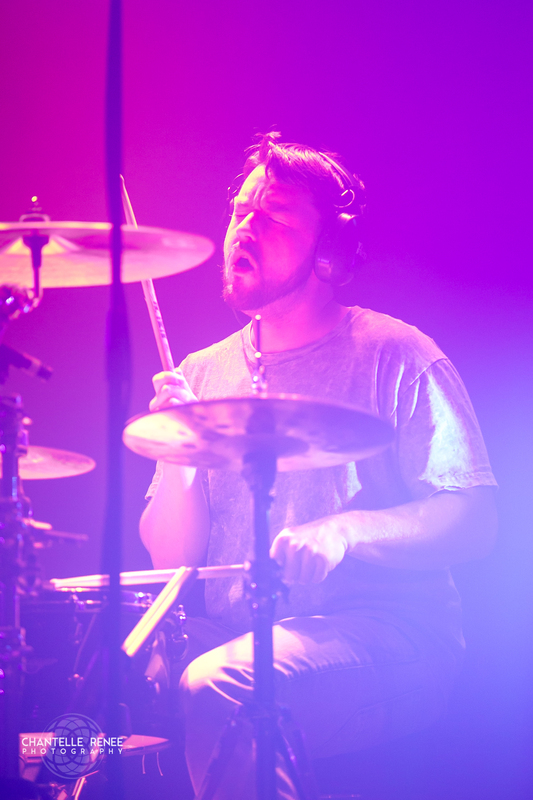 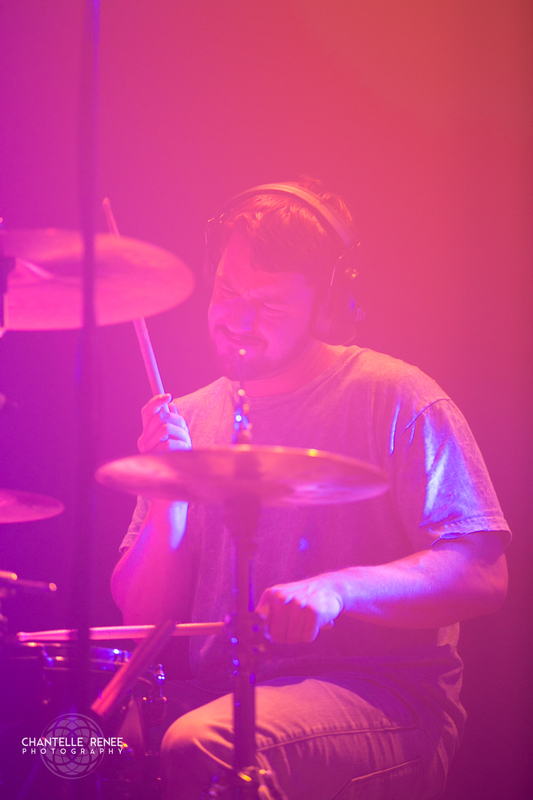 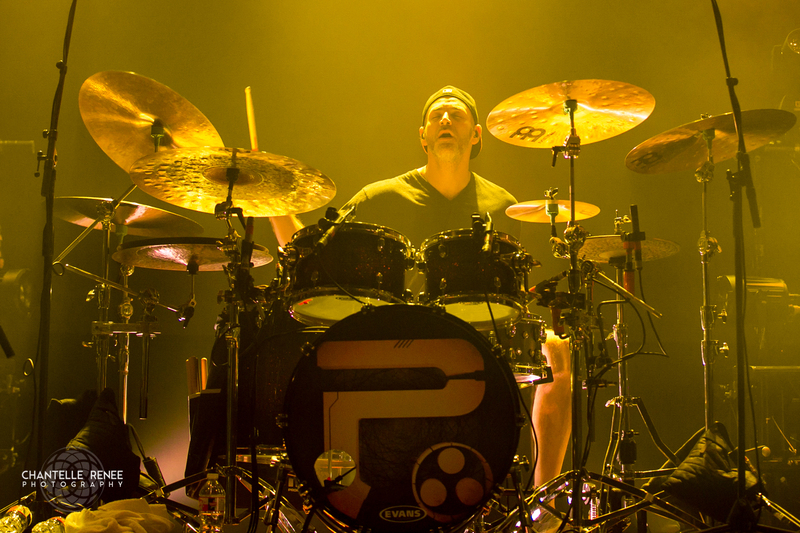 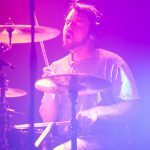 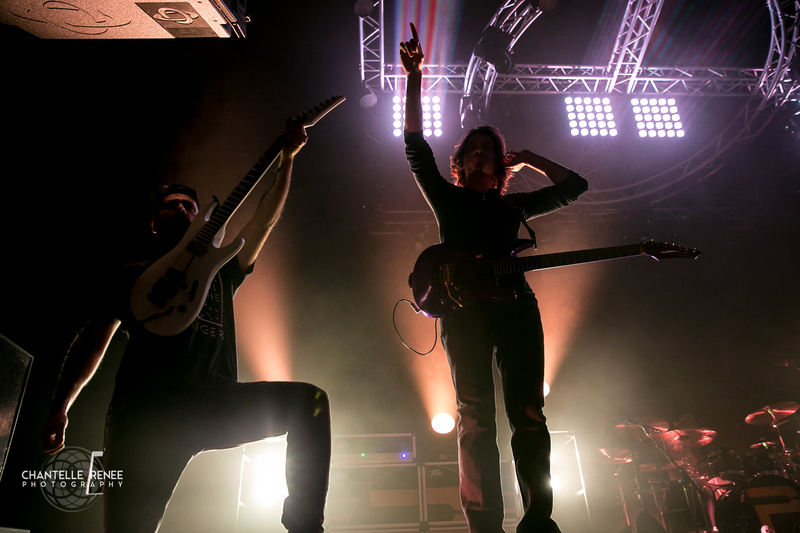 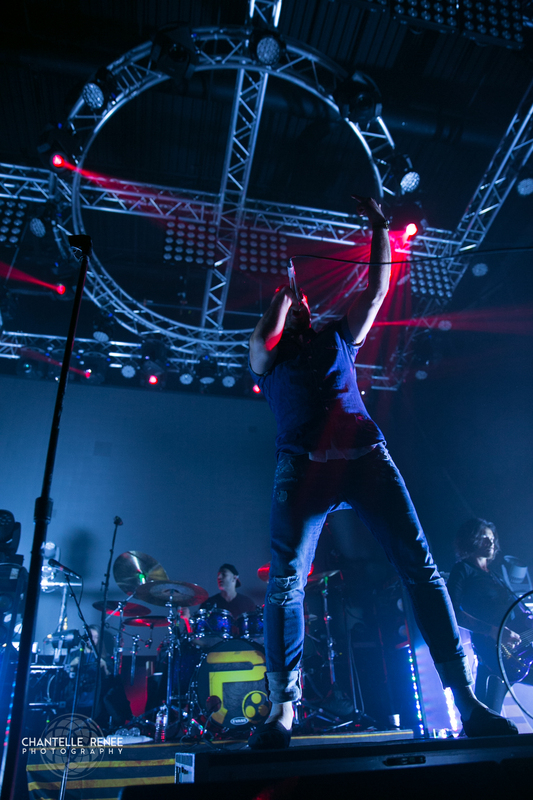 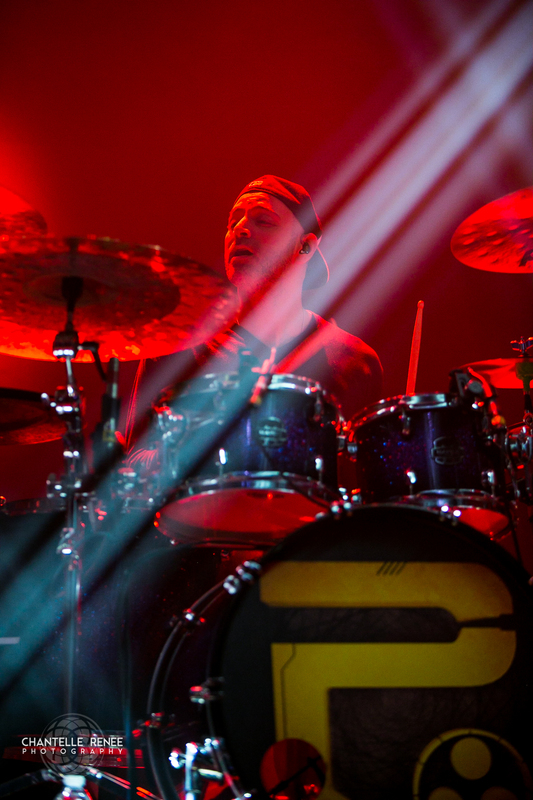 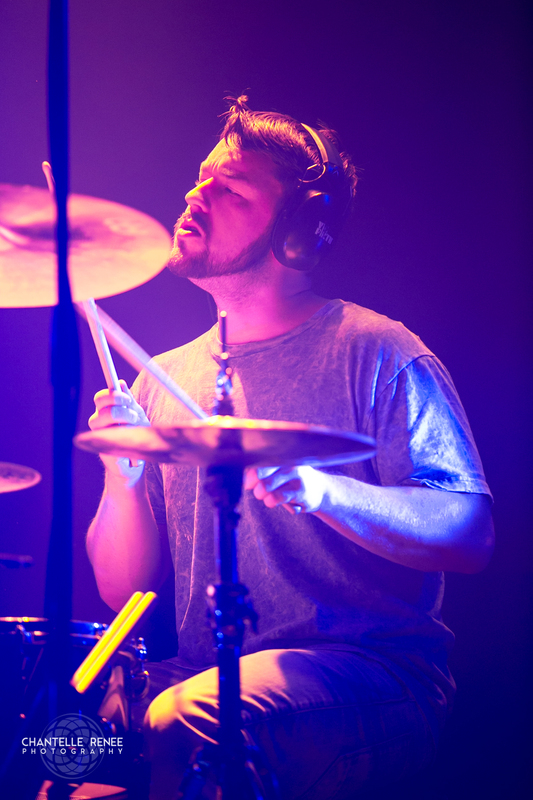 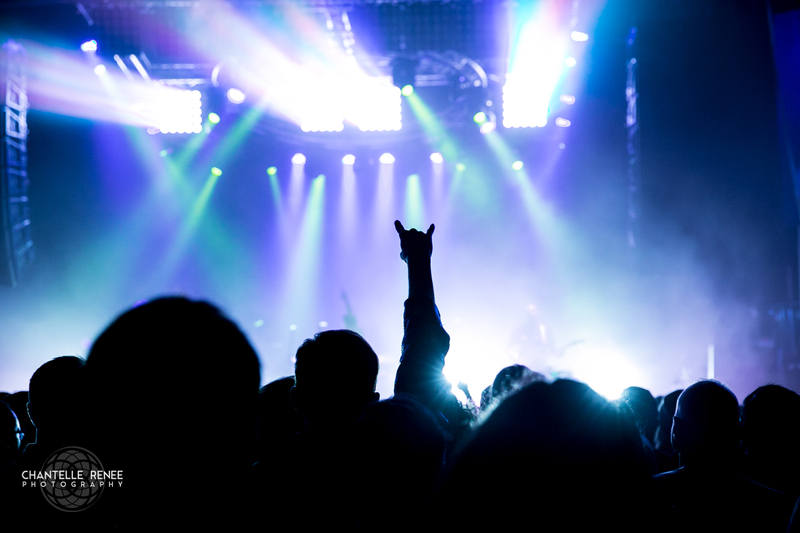 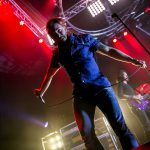 As the newer material focuses more on a groove and thump based rhythm, their set was peppered with both thump and tons of melody to satisfy all. 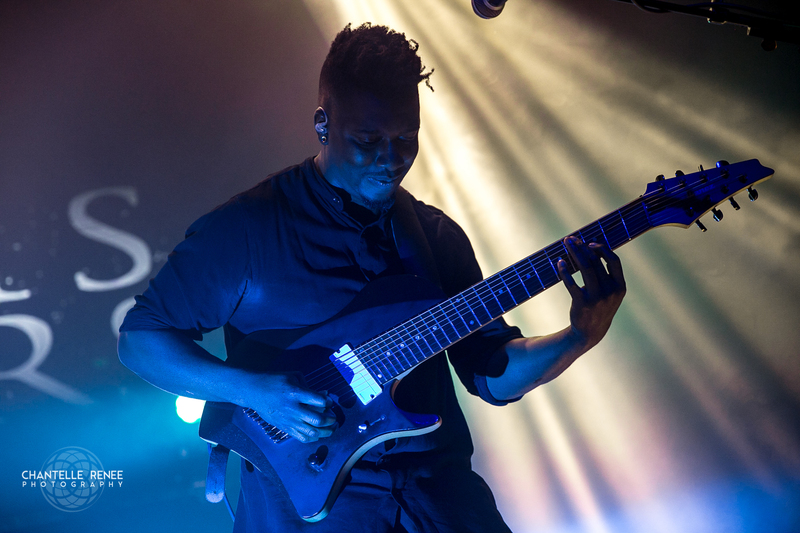 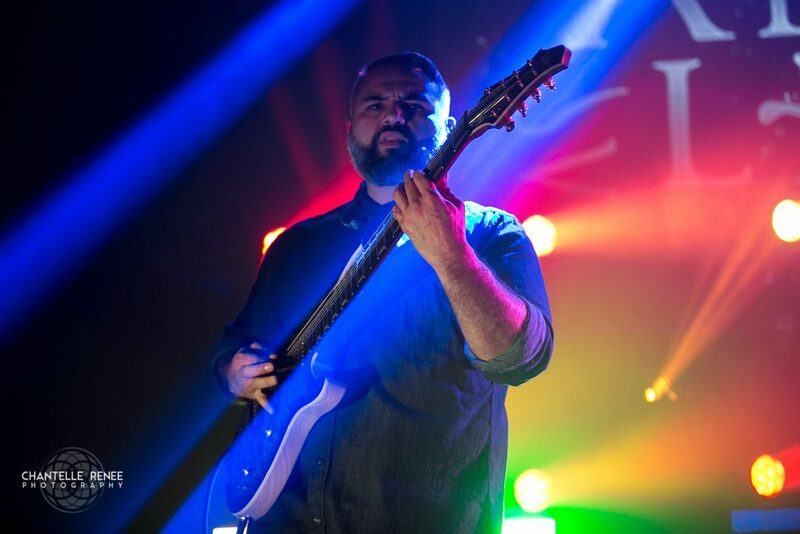 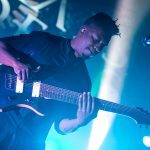 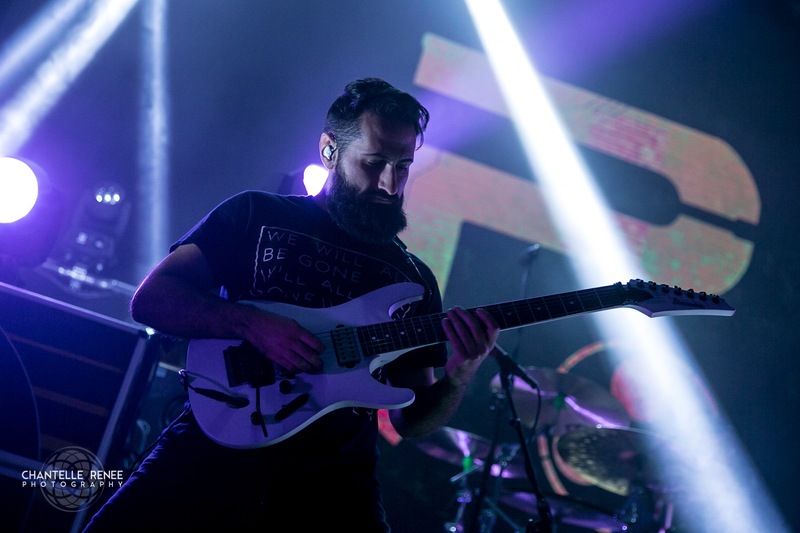 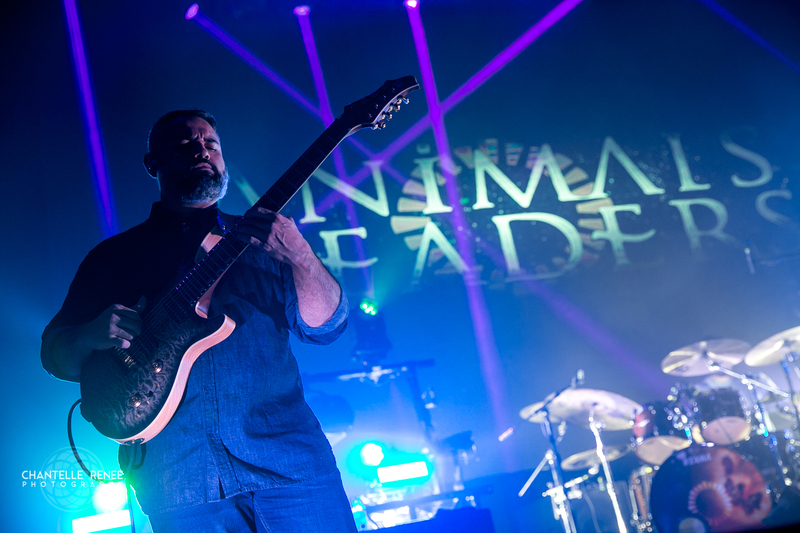 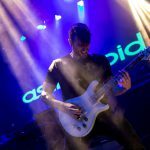 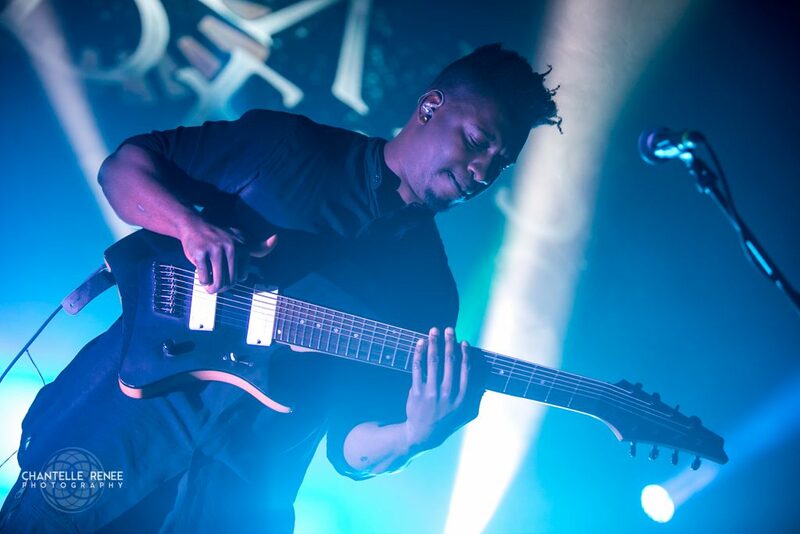 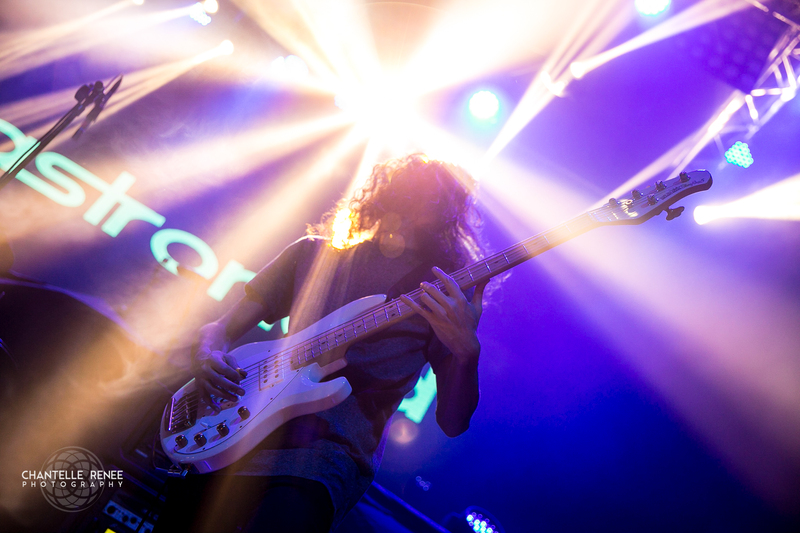 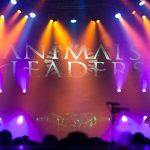 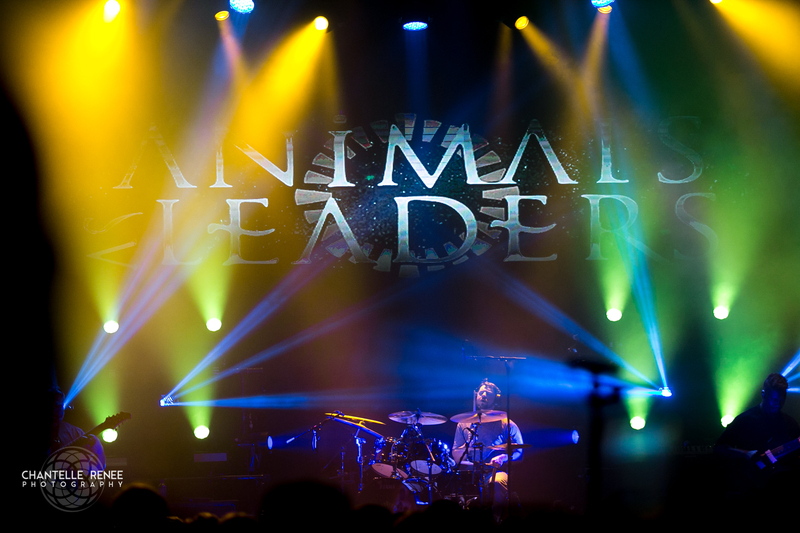 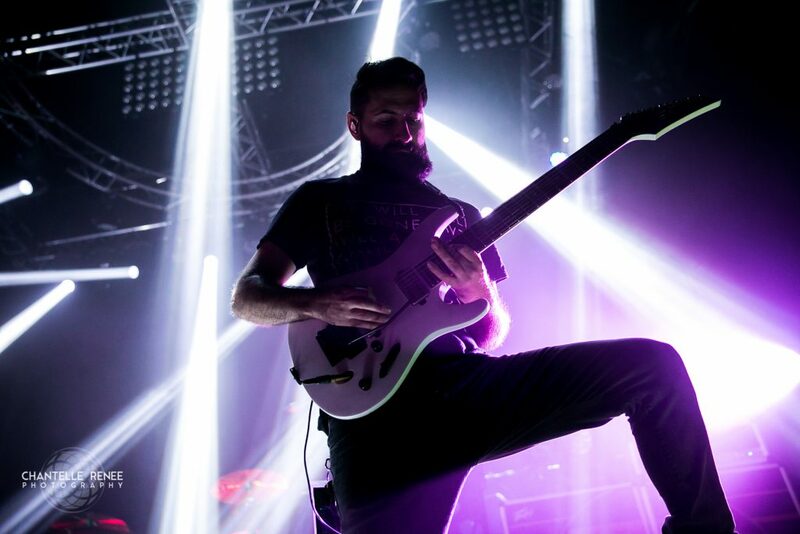 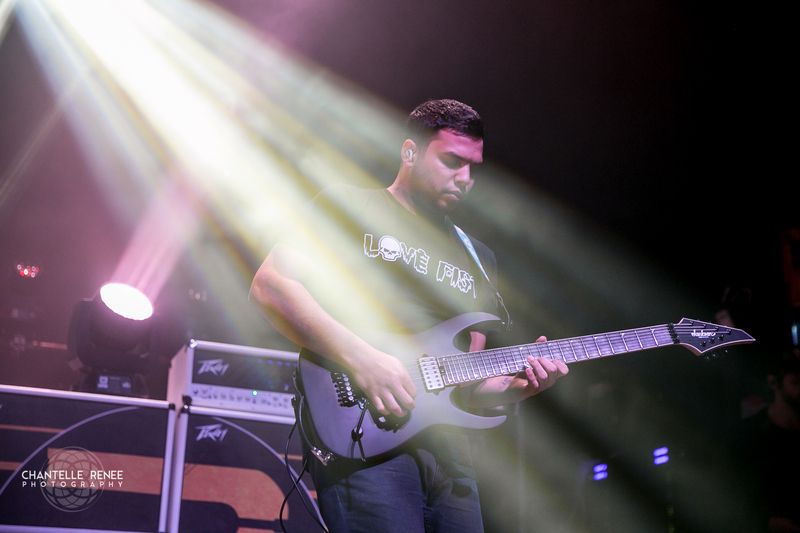 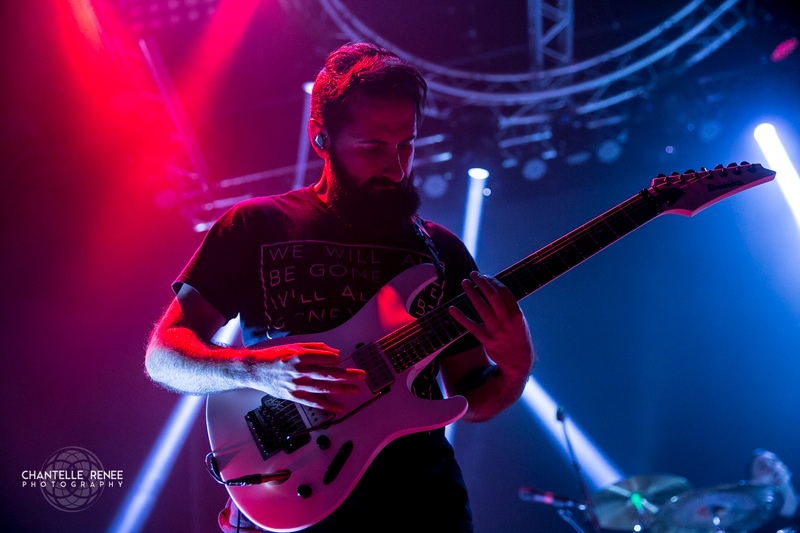 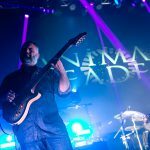 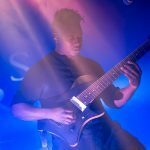 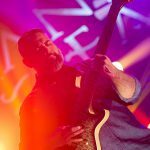 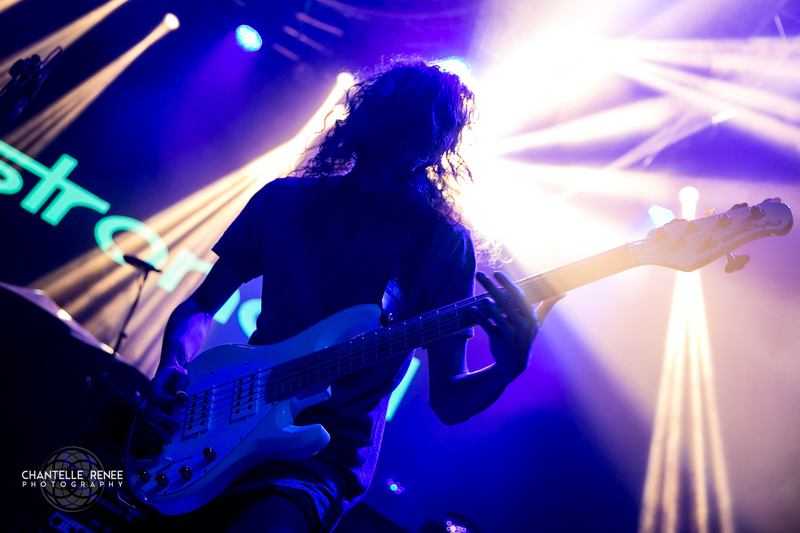 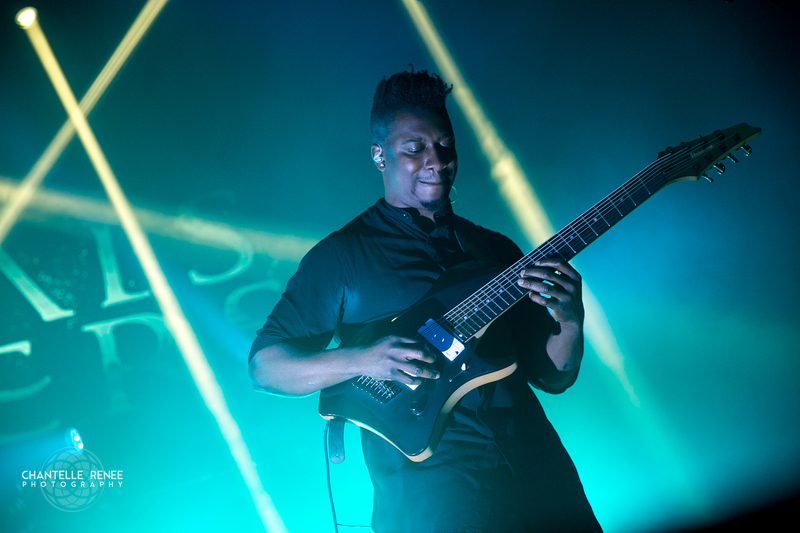 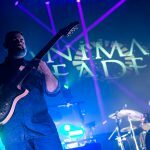 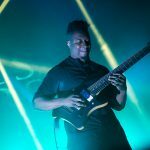 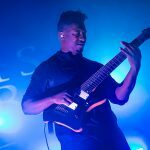 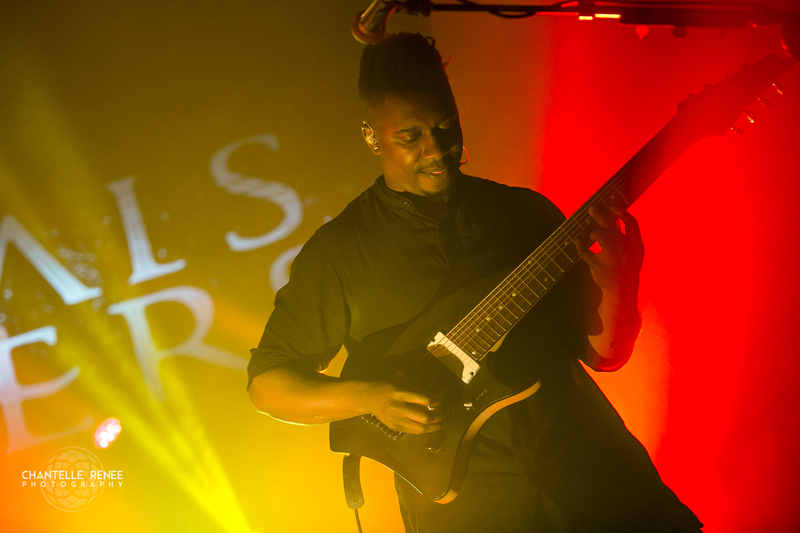 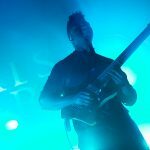 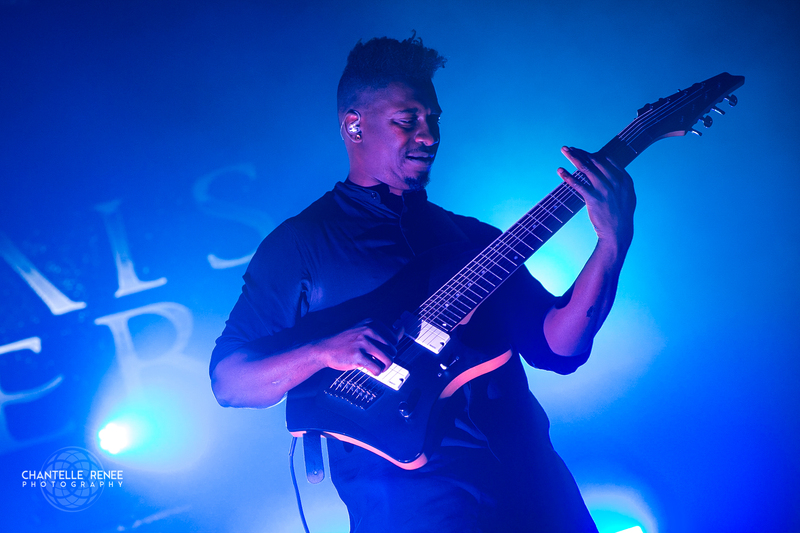 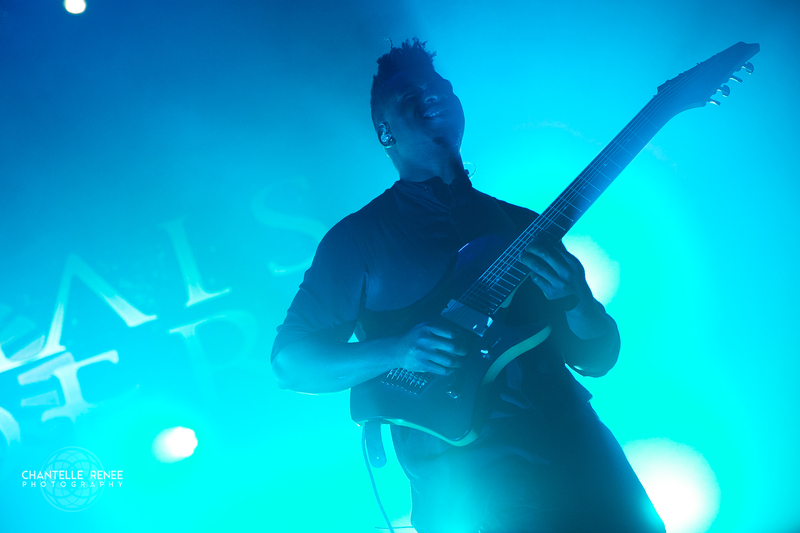 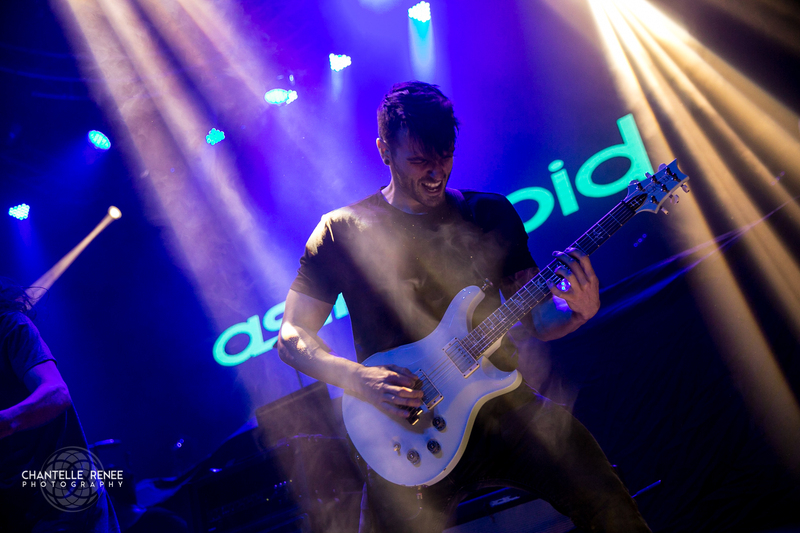 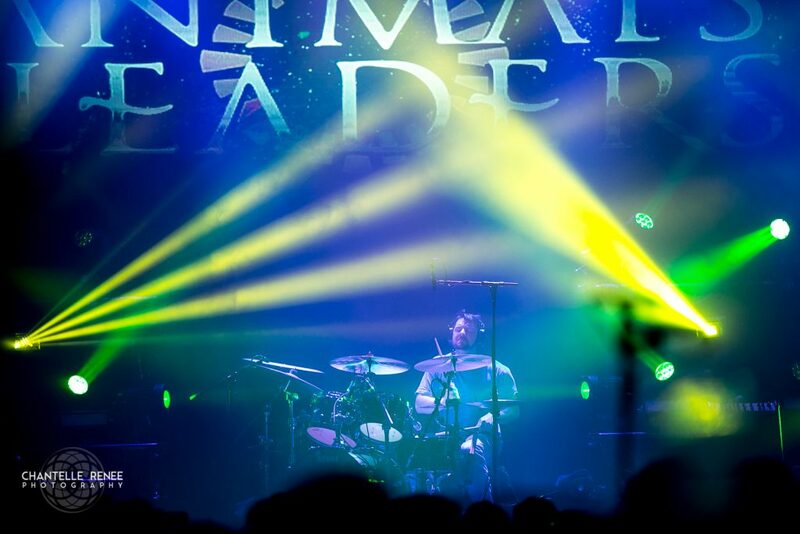 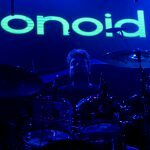 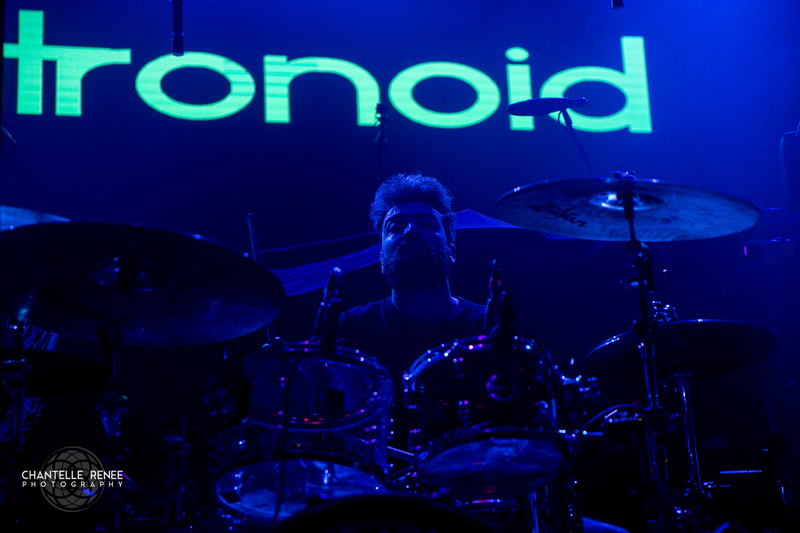 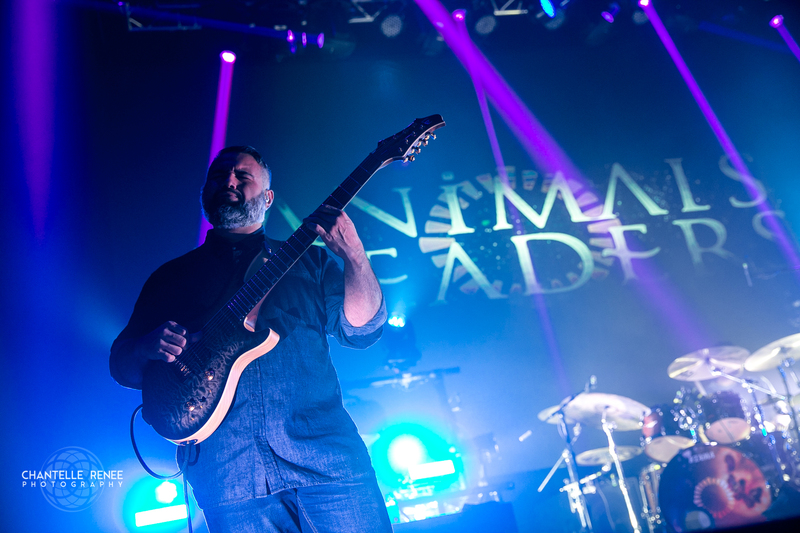 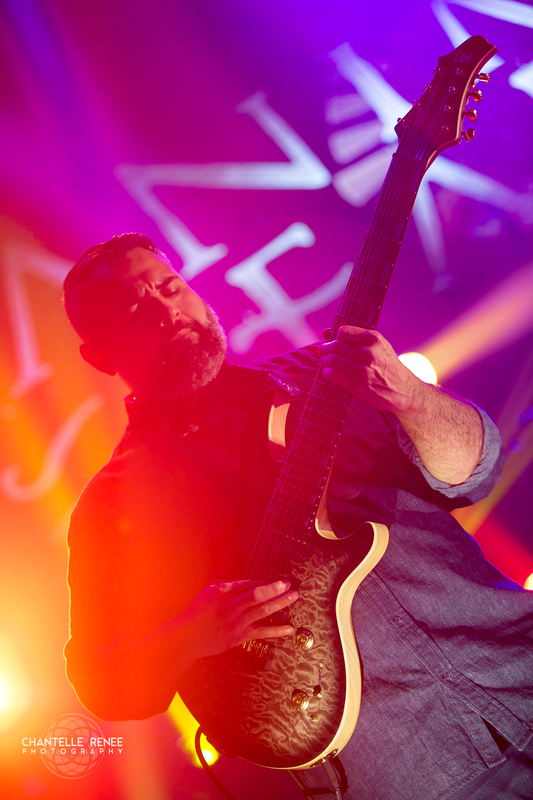 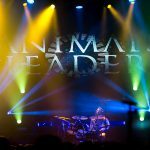 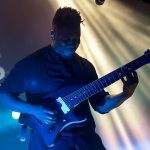 As beams of light danced around the venue, Animals as Leaders’ performance still reigns as an almost trance like experience, melding dramatic mood lighting alongside instrumental prowess that not only impresses with technique, but carries beautiful melody interwoven within and carries emotion among it all. 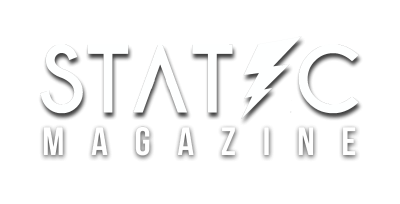 Though for this particular performance they may have forgone the digital stage scrims that run alongside the music, the performance remained just as captivating and kept the audience engaged and moving their heads along, finishing up with their fan designated magnum opus, “CAFO”, a fast and shreddy track from their self titled first album featuring Periphery’s guitarist Misha Mansoor as well. 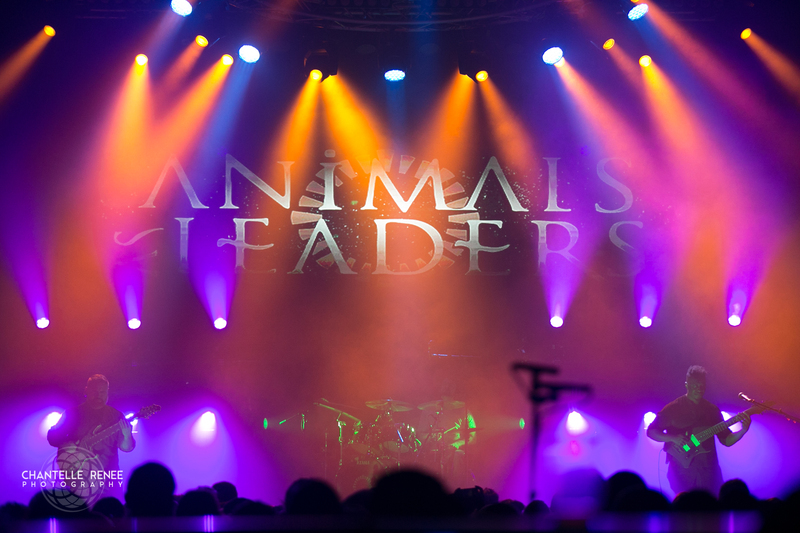 Instrumental bands typically draw a very niche crowd so it never ceases to amaze how Animals seems to bring people out in droves, especially considering how I hadn’t seen Gas Monkey Live this packed in a long while.